Encyclopedia of Islam, Second Edition provides high school and junior college students, as well as laypeople, with everything they need to know about this religion. In more than 550 A-to-Z entries, this encyclopedic guide explores the terms, concepts, personalities, historical events, and institutions that helped shape the history of this religion and the way it is practiced today. 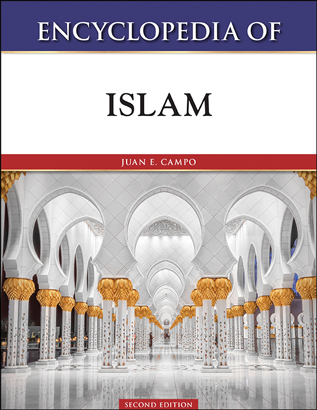 An informative introduction provides readers with an overview of Islam. A chronology, a detailed bibliography, and photographs complete this timely resource. Juan E. Campo, associate professor of religious studies at the University of California, Santa Barbara, holds an M.A. and Ph.D. from the University of Chicago's History of Religions program. He specializes in the comparative study of the cultural formations of Islam in the Middle East and South Asia, sacred space and pilgrimage, and political Islam in the contexts of modernity. His research has taken him to Egypt, where he has lived, studied, or taught for nearly six years, as well as India, Saudi Arabia, Bahrain, Turkey, Malaysia, Singapore, Thailand, and Israel. Professor Campo's first book, The Other Sides of Paradise: Explorations in the Religious Meanings of Domestic Space in Islam, won the American Academy of Religion's award for excellence, in 1991. He has edited or contributed articles to a number of leading reference works, including Merriam-Webster's Encyclopedia of World Religions, Encyclopedia of the Qur'an, and the Macmillan Encyclopedia of Islam and the Muslim World. His current projects include a comparative study of modern Muslim, Hindu, and Christian pilgrimage.